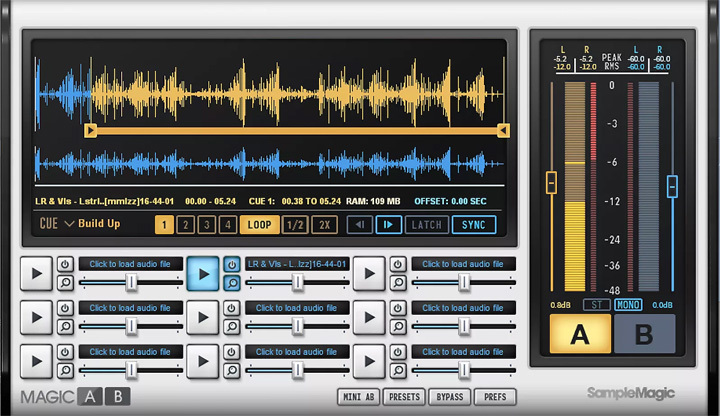 The year is off to a great start in the world of creative music software, with a bunch of new products and updates already being announced and released. In January, we saw the release of a few new processors from boutique companies, including Tone Empire, IK Multimedia, and Sample Magic. And of course, Ableton's long-awaited Live 10 launched this week. 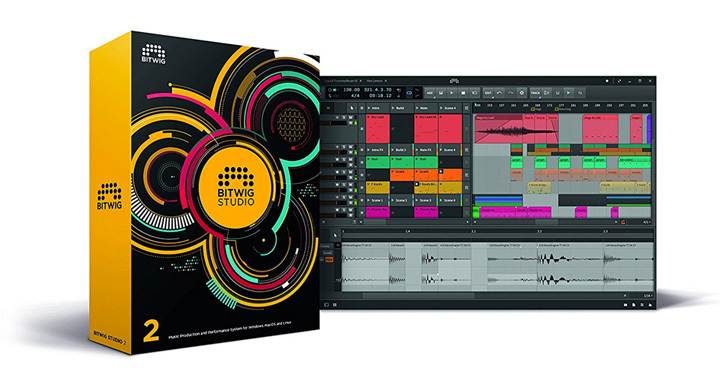 BitWig also announced a big update for Studio 2, Sugar Bytes announced a new FM synth, Syntonica released a free wave-based synth, and we got new sample collections from Gravitas Create. We at Reverb also partnered with industry veteran Craig Anderton for an exclusive loop pack. Below, we’ve collected the most exciting software news of the year so far, highlighting the best new products and their most impressive features. Last month, we covered the announcement from BitWig that its Studio was getting a major update, with the release of version 2.3. The new version is going to feature improved workflow features like expanded viewing capability, slice (onsets audio editing), two new stretch algorithms (including Elastique), time signature hot swapping, and voice stacking. It also adds Legacy (a vintage sampler algorithm). BitWig Studio 2.3 will also feature an improved and expanded sound library, and the new Phase-4—a four-oscillator phase manipulation synth inspired by iconic FM Synths, such as the DX7, with expanded phase modulation and distortion capabilities. 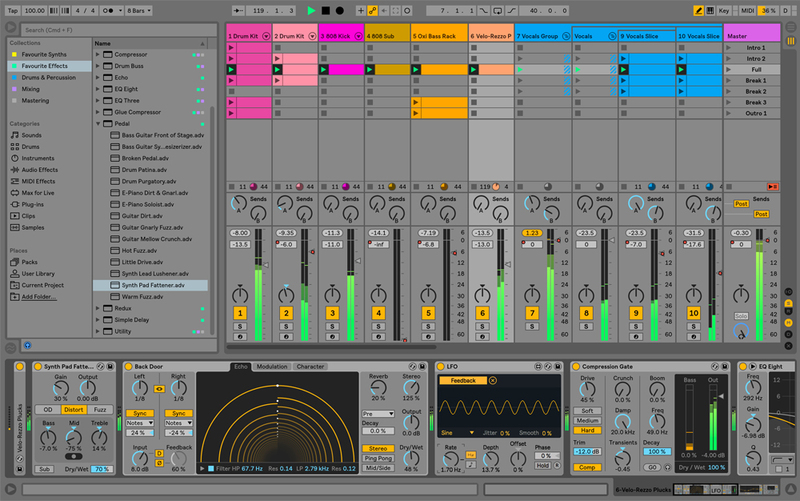 On February 6, Ableton released its latest iteration of its incredibly popular DAW—Live 10. 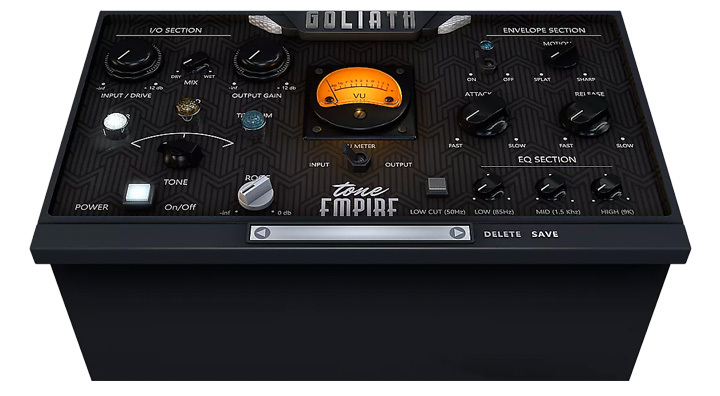 It features a new Wavetable synth, the analog-style Echo plugin, and a redesigned, user-friendly interface, as well as powerful mixing tools for producers and engineers. As with previous versions, the DAW is available at various levels of price and functionality. It can be purchased as Ableton Live 10 Intro, Live 10 Standard, or Live 10 Suite. The Goliath is a transformer, tube, and tape saturation plugin with envelope follower and analog-modeled EQ, making it an easy choice for musicians looking to add a saturation staple to their rig. Players can choose from a variety of saturation types—Silver (solid-state), Gold (tube), and Titanium (tape)—via the the tone selector and then dial in sweet spots with the “input/drive" control and the “roof" control for truly dimensional analog sound. The envelope and EQ sections can also be molded using the “motion" control. The new Magic AB is a fast and accurate audio comparison tool that allows users to quickly compare and balance multiple audio streams. It features three unique referencing modes: Sync, to compare your current mix with older versions; Latch, to follow the DAW timeline; and Manual, for freeform referencing. You can then balance the relative volume of mixes with extensive, accurate, easy-to-read metering (peak, RMS, and crest values with adjustable peak fall time). All of this amounts to a faster, easier-to-use, and more accurate method for comparing multiple audio streams than any DAW on the market currently offers. Sample Magic also came out with the Boost Pro—a powerful tool for effective mix buss processing. 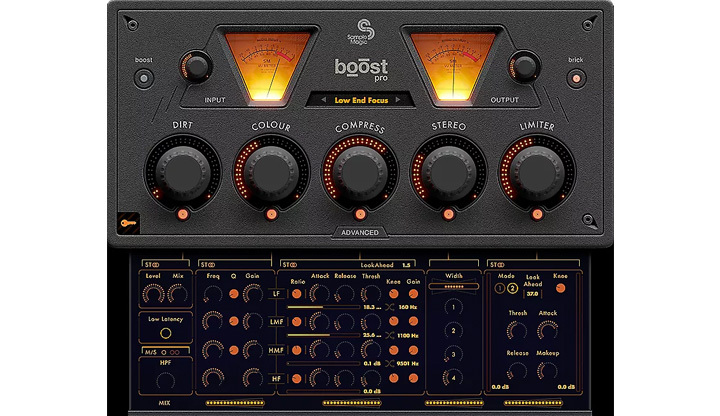 Boost Pro allows users to dial in high-quality distortion, multi-band compression, 4-band EQ, brick-wall limiting, and more. Every module possesses a mid/side processing option, low-latency mode, RMS metering, and CPU-optimized performance, and individual levels of each effect can be easily adjusted using the macro knobs. The T-RackS Precision Comp/Limiter is the next generation of IK Multimedia’s legendary British-style compressor, the 2254. This update features additional flexibility with standard stereo (L/R) or Mid/Side (M/S) operation and added bonuses, like the input control that allows for a much more pronounced compression effect. A separate compressor and a limiter allows for a unique effect when combining the two independent sections. You can use the compressor section a for gentler compression or contrast the limiter for a more audible dynamic control effect. The Aparillo is a powerful 16-voice FM synth from Sugar Bytes that features format shifting, wave folding and shifting, a multimode filter with spacializer. It also features an orbiter for one-touch sound morphing, wide modulation options from ten different sources, a melody generator, and 500 presets. 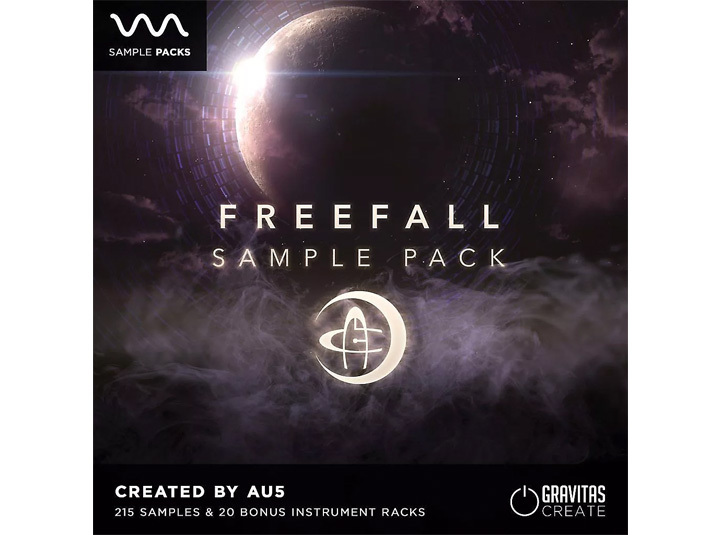 Gravitas partnered with Au5 for this brand new Freefall sample pack, featuring 215 samples from the band’s Freefall EP. The samples are varied by instrument type—basses, drums, FX, synths, and vocals—and are designed for production across dubstep, DnB, electro, and house music genres. With this sample pack, you’ll also get 20 bonus Ableton instrument packs and an hour-long in-depth tutorial on track creation. 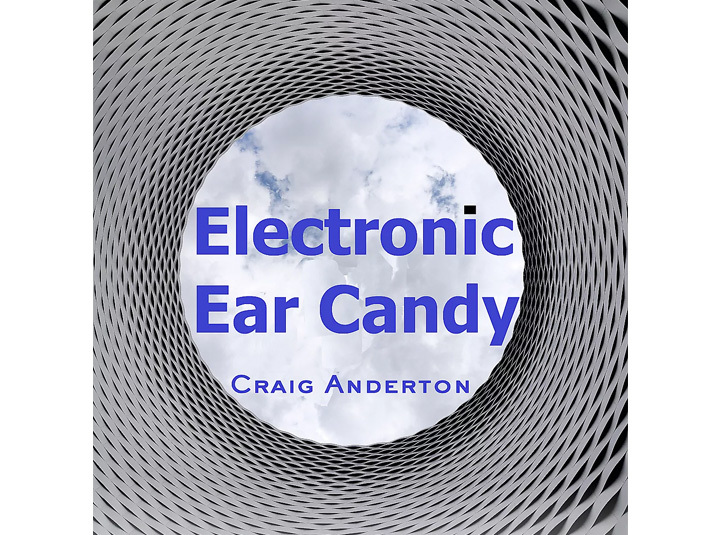 We partnered with Craig Anderton for this next sample pack, Electric Ear Candy, which features 387 loops—including tonal rhythms, chord progressions, melodies, drums and percussion, FX, and electronic drum one-shots—designed to compliment electronic tracks in the EDM and pop genres, especially. The pack also features separate individual layers that are designed so that players can create layered and textured sounds. 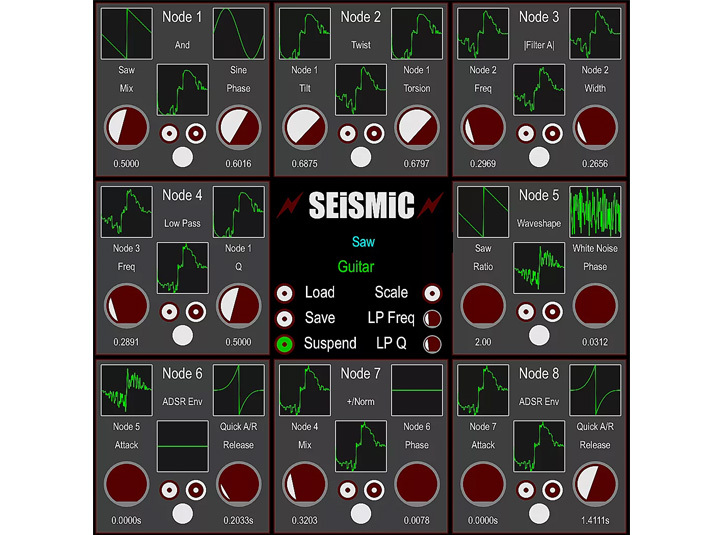 Last but not least, Mac users can download this fully modular, wave-based synth from Syntonica Seismic for absolutely free right now. 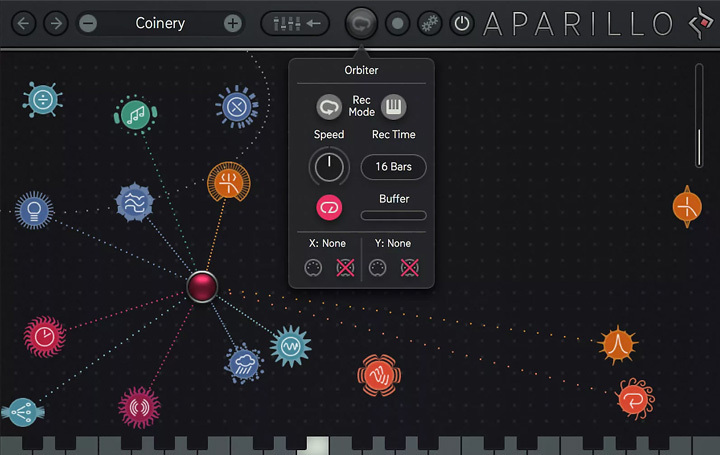 Using its eight-node interface, players can construct custom pads, leads, and percussion more easily than on a more traditional synthesizer.